At dawn this morning in Miami, a Chevy pick-up truck traveling eastbound on Northeast 15th Street, in downtown Miami, was t-boned by a white Daimler SMART car traveling southbound on Biscayne Boulevard. One of the investigators told the media that it is believed the driver of the SMART car failed to stop at a stop sign or a red light, which was the cause for the two vehicle to collide at such a high rate of speed. 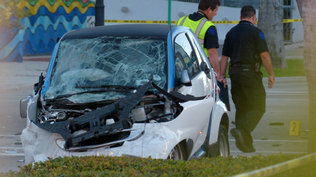 The SMART car involved in this incident, whose driver was supposedly at fault, was a CAR2GO vehicle. According to the company’s website, CAR2GO is a mobility program launched in Austin, Texas back in November 2009. The company provides a fleet of free-floating vehicles distributed all over the city. Individuals who become members of CAR2GO have the ability to use any vehicle from the CAR2GO fleet at any time.